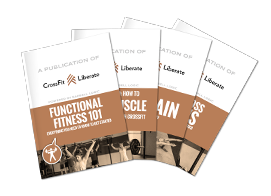 At CrossFit Liberate, we’re all about constant improvement—from the ground floor up. Our brand-new 6,500-square-foot facility is downtown Athens’ premier place for fun and fellowship through fitness—with lots of top-notch equipment and the most supportive coaches around. We’ve got tons of character, from our rustic brick interior—complete with 35-foot bow-truss ceilings, a turf room, to our welcoming front desk and inviting, well-maintained gym space. We also offer childcare at no extra cost with membership! Join us for classes, and you’ll meet CrossFitters of all ages and skill levels—plus some of the area’s most welcoming coaches. If you’re ready to get after your goals while meeting like-minded, encouraging new friends, sign up for any of our regular or specialty classes, change up your routine or start a whole new regimen. Once you step into our box, we’re sure you’ll never look back.